Looking to rent or hire plastic moving boxes Sydney? Without plastic moving crates Sydney rental, moving to another place can be a hectic task, especially when it comes to packing and moving your belongings without any damage and in the most efficient way. Ever wondered looking at the huge pile in your home how to get all that stuff to another place? We are here to provide you with a proper solution to get rid of all your worries related to moving boxes. We provide plastic moving boxes on rent in Sydney for easy storage and moving your stuff. We offer you a method which lets you use our cheap moving boxes Sydney on a rental basis which are strong, affordable easily stackable and perfect for any kind of stuff to be moved. The plastic moving boxes or removal boxes Sydney are made of strong, durable plastic which makes them perfect for storing all of your stuff, be it books, clothes, kitchenware, appliances, makeup, dinnerware, anything and everything. And the best part of using our plastic moving boxes is that you do not have to worry about any damages, breakage or lack of space. By hiring our plastic moving boxes Sydney you also do a big favour to the environment by cutting out the use of cardboard boxes and going green with these usable plastic moving boxes for hire in Sydney. Plastic Moving Boxes can save time – You do not need to waste any time to assemble or tape together cardboard boxes as this plastic moving crates/boxes Sydney are ready to use so that you can use your time more efficiently on moving and not wasting any of it assembling boxes to move. Plastic Moving Crates can Save you Money – As we provide you with cheap plastic boxes for moving on rent in Sydney, you do not have to waste any money on purchasing materials for making your own boxes. Plastic Removal Boxes can Protect Environment – With the option of renting the moving boxes Sydney you help to reduce environmental wastage because you can return these plastic moving boxes once you are done using them after moving, and we provide it to the next customer for next use. This reuse of these plastic moving crates Sydney helps us support the green initiative for benefit of the environment. It is a known fact how messy and unorganized moving could be, how cluttered your whole place could be while you think about what goes where and how many plastic moving boxes in Sydney you need, what size, what shape, what volume you require when you look for moving boxes. Even after so much work put in you are never sure if it will be enough space and strength to complete your moving with stuff. Now leave all that worry out of your head, and move on to place your order for the plastic moving boxes on rent from us. You can get to know the exact size, volume and shape of these Plastic moving boxes Sydney for proper organization and clutter-free packing and moving. You can make use of the supplied labels to make it easier for you to organize and pack your things in a hassle free. The boxes can be filled up to 20 kg weight and the lid of the box can take up to 100 kg weight on it, enhancing your stacking experience without any risks of breakage and damage. Why Choose Us for to Rent or Hire Plastic Moving Boxes/Crates in Sydney? The rental plastic boxes for moving house Sydney that we offer are made of commercial grade plastic which makes them highly durable and strong to easily carry weight up to maximum 22 kg per crate. These moving or removal boxes Sydney are designed in a way for easy stacking over each other, which lets you organize them in a manner to save space without any risk of them falling off during transportation. Easy handling is another benefit you reap out of our service of moving boxes on hire Sydney. These plastic removal boxes come with attaches handles which make it super easy for you to carry them. We also provide easy to carry trolley with every order you place with us for the rental moving boxes, which makes it even more comfortable for you to carry all that stuff from your house to your vehicles, one or more boxes at once. The plastic removal boxes Sydney we provide come with an attached lid so that you can close them as and when you ready without worrying about finding a lid or cover for your box. The lids attached to the boxes come with the interlocking system so that in case of an accidental drop the lid will not come off, protecting your stuff from falling out. No more worrying about getting your boxes with stuff in it wet in the rain while moving as these plastic moving crates for rent is totally water resistant. 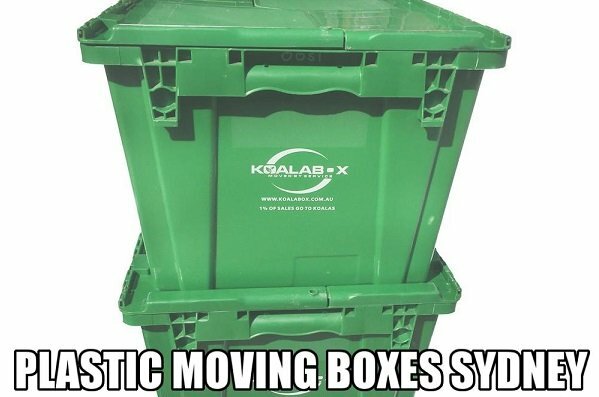 Finally, no more throwing out your used cardboard moving boxes after you are done with your moving as now you can just call us and return these plastic moving boxes back to us. We will be there on your call to pick them up and make them clean and ready for use by our next customer, hence minimizing wastage and space. How the Process of Hiring or Renting of Plastic Removal Boxes in Sydney Works? We deliver plastic moving boxes for rent or hire in Sydney and will soon be providing other serviceable cities on our list of places. These plastic removal boxes Sydney offer you advantages such as maximum durability, ready to use, water resistance, easy stackability, and handling, ensuring the highest level of convenience to anyone who is seeking to hire packing boxes for moving house. We deliver you moving boxes to your homes or office, which you can use to pack and move at your own convenience, and when you are done using them we pick them up. We also provide Green Moving Boxes in Sydney and Office Moving Boxes in Sydney. We offer a wide range of custom packages to choose from, for specific moving needs and volume of things to be packed and moved. Instead of going for cheap moving boxes Sydney goes ahead and check out our affordable packages to suit your needs and place your order with us right away and be assured to have the most convenient and hassle-free moving experience. Call 0468 548 164 to get free quotes to hire plastic moving boxes Sydney.